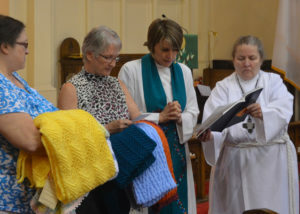 The prayer shawl ministry began over a decade ago at First English Church and has grown through years of dedicated effort of women knitting and crocheting shawls, scarves and blankets. Each begins as a prayer and continues during each knitting session with added prayers. Over the years the ministry has produced over two thousand shawls and people both in and out of our congregation have been blessed with a shawl during a time of illness or crisis or celebration. Prayer shawls and scarves are blessed during worship before being distributed to recipients. The ministry has its origin with First English women attending a 1997 Women’s Leadership Institute at Hartford Seminary. Since that time the idea of a shawl ministry has grown and been carried across the globe and through all Christian denominations. and wrapped in love. Blessed Be! For more information on shawl ministries, its history, photos and support materials see Shawl Ministry. Know someone in need of a prayer shawl? Contact the church office!